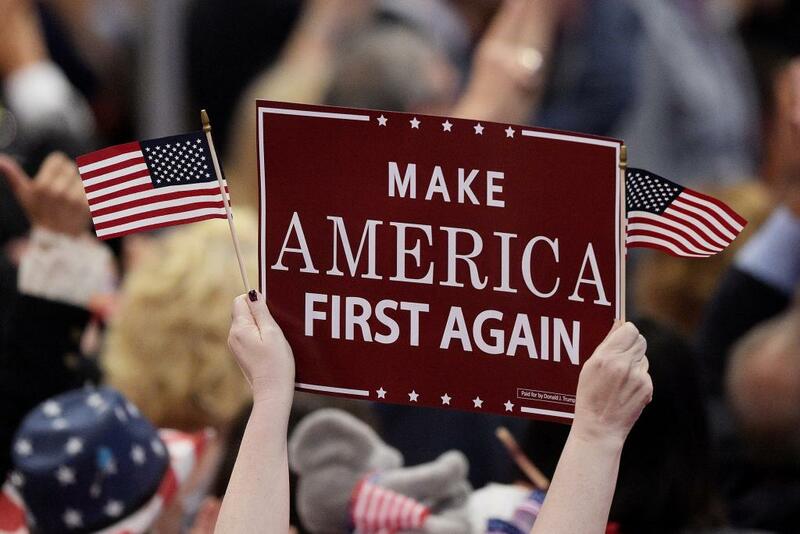 Home » What Would an ‘America First!’ Security Policy Look Like? ‘Since 2001, the U.S. military budget has more than doubled in nominal terms and grown over 37% accounting for inflation. The U.S. spends more than the next eight countries combined. That doesn’t matter politically, though. The message is, if you don’t support giving more money, you are guilty of neglecting the nation’s security and of killing service personnel. No wonder only a brave handful of Republican legislators consistently are willing to say No, like Senator Paul and a few House members: Justin Amash (Michigan), John Duncan (Tennessee), Walter Jones (North Carolina), Raul Labrador (Idaho), and Thomas Massie (Kentucky). Here’s a crazy idea. What if instead of taking for granted a national security policy that seeks to maintain U.S. supremacy over every square inch of the globe we figure out what our real defense needs are – protecting our own country, not mucking about in the rest of the world – and then structure and fund the forces we need? What would that look like? Western Hemisphere comes first, not last. As they say in New England, “Good fences make good neighbors.” Presumably good walls make even better neighbors. Whatever happened to controlling our own border with Mexico, which was the cornerstone of President Donald Trump’s campaign? That remains hostage to political horse-trading and a budgetary game of chicken in the Washington Swamp. As far as the political class is concerned, the Wall can wait until mañana. At the same time, the U.S. is all too happy to meddle in our neighbors’ internal affairs under the justification of “democracy promotion.” Recently Secretary of State Rex Tillerson claimed such meddling was an expression of the Monroe Doctrine, which he said “clearly has been a success, because… what binds us together in this hemisphere are shared democratic values.” Really? That would have been big news to President James Monroe, who promulgated the Doctrine back in 1823 when no other country in the Americas could be described as a democracy and when even most of the U.S. Founding Fathers would have disputed that label for the Republic they sought to create. Monroe’s declaration had nothing to do with democracy. Rather, its core was a warning to other powers not to establish colonies in our hemisphere, an exclusion which we have considered essential to our security for almost two centuries. Even as a relative infant on the international scene, long before our young nation had emerged as a power on a par with those of Europe, the United States considered it reasonable to ask other powers not to step on our toes in our own neighborhood. In Europe, NATO forces should stand back from Russia’s borders and territorial waters. NATO expansion should be ended – even after the Trump administrations ill-advised decision to induct tiny and corrupt Montenegro – while a new security architecture in Europe takes shape. The Alliance’s 2008 pledge to bring in Georgia and Ukraine should be withdrawn. Better yet, get us out of NATO entirely! We and our European friends should be finding a way to cooperate with Russia on pulling Ukraine out of its political and economic crisis as a united, neutral state, not pumping in lethal weapons so touch off renewed large-scale fighting. Get the hell out of the Middle East and Central Asia. The NSS risibly refers to the undesirability of America’s earlier “disengagement” from the region, evidently a reference to the Obama administration’s not being quite as bellicose as its authors might prefer (for example, only supporting terrorists in Syria, not invading the place outright), Of dubious value even in its time, President Jimmy Carter’s 1980 declaration that the Persian Gulf region lies within thevital interests of the United States is only a dangerous absurdity now. The entire region designated under the goofy moniker “Greater Middle East” is a welter of ethnic and religious antagonisms and unstable states that for America have only two things in common: (1) they ain’t us, and (2) they ain’t nowhere near us. It’s not America’s job to sort the place out, via such fool’s errands as nation-wrecking in Libya and Syria, nation-building in Afghanistan and Iraq (after wrecking them), and “mediating” to “solve the problem” of the Israelis and the Palestinians.